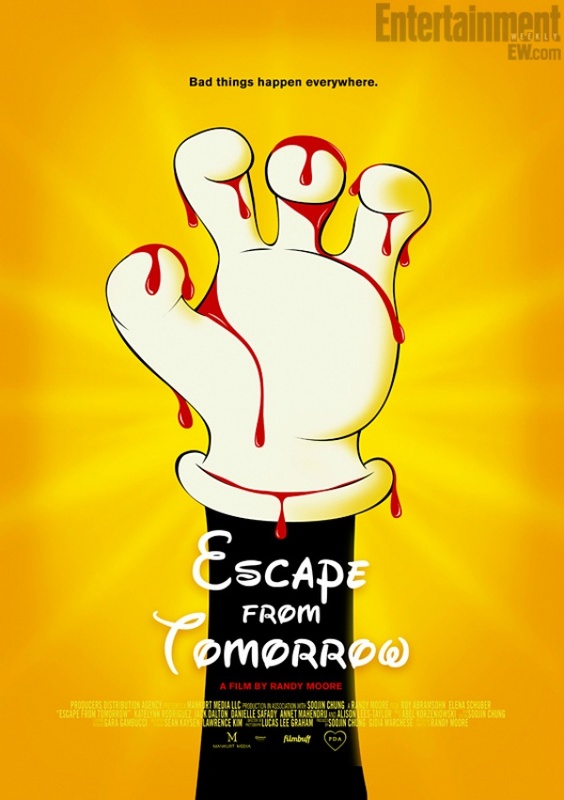 I watched about 40 minutes of Escape from Tomorrow and thought that it would likely go on my Top 10 list, unless it went completely off the rails in the back half. It did, but I’m still compelled to include it here anyway. It’s not even that great of a movie, to be honest. The plot is alternately uninteresting and absurd – the first half largely being about a man who stumbles through Disney World in despair and paranoia after being fired from his job early in the film, questioning his relationship with his distant wife; the second an incomprehensible and shoddily written amalgam of sci-fi concepts. The actors aren’t even very good, except maybe for the children who convincingly portray children. 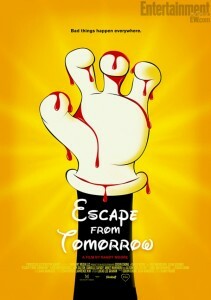 What anybody writing about Escape from Tomorrow is sure to mention is the fact that the movie was filmed covertly at Disneyland and Disney World, and that on its own is something of a feat, to be sure. I’ve read online that the leads were forced to go on the “It’s a Small World” ride a dozen times in order to get one scene right, which does a great job of illustrating their devotion to the project even before you realize they likely had to wait for hours in line (unless they got a Fast-Pass!) for each go-round. But what’s so stunning about it, for me, isn’t necessarily the location itself. The movie is filmed in black and white, which can be cynical way to make garbage look “artistic”, but here it’s vital to the film. The parks, sometimes referred to as “The Happiest Place on Earth”, indeed take on a sinister atmosphere thanks to the interplay of light and darkness. The movie is entirely successful because of what it does visually. There’s an amazing sequence where the male lead loses his daughter during the fireworks at Epcot, and the blasts of light obscuring the dark images is incredible. The movie is filled with interesting, chilling compositions. I’m going to forget about the rest of the movie and just revel in the one thing it did which is incomparable. Somewhat analogous to Escape from Tomorrow in the sense that the story behind the film is at least as interesting as the finished product, Josh Oppenheimer’s documentary covers a mid-20th century genocide in Indonesia… from the mouths of the killers themselves. Maybe it sounds exploitative or cold, but in fact the movie is so successful because of the ethical minefield the movie steps into. The emotional, self-reflective journey that its subjects go through (some who continue to speak of their slaughter with pride, others who start to recognize the error of their ways) is powerful and leaves the viewer wondering what, if any, manner of penance is possible for these men. As wrenching and heartbreaking as much of the film can be, it also has a humorous streak: the killers are asked to re-enact their grisly murders, essentially making a movie-within-a-movie. Ironically, it is only by seeing their actions from a remove, by fabricating them, that some of the participants begin to realize how real their actions were. The thin line between what is “real” and what isn’t plays out in many ways throughout the movie, a sharp center that is very critical of the status quo in the country. Huge rallies are held in support of this or that political party or politician, but in confidence it’s admitted that nobody is there who wasn’t bribed. The killers feel important and macho, but their bravado masks their immaturity and lack of humanity. That viewers wrestle with the ethical dilemma of the movie’s existence throughout its run-time is part of the point. It’s a moving, shocking film. Also much like Escape from Tomorrow, I found myself taken by Mr. Nobody in spite of its many flaws because it was clear that it was made by somebody attempting to do something unusual, mainstream appeal be damned. It has a grating streak of pop philosphy at its core, allowing characters to ask day-one philosophical questions like, “Why can we remember the past, but not the future?” But beyond that, the movie is playful and inventive. A car enters the scene by being placed on the street by the giant hand of a child. A scene begins skipping and stuttering, only to reveal that it’s because Nemo Nobody (Jared Leto) is recalling it from memory and his recollection of events is faltering. Like 2012’s Cloud Atlas, which this movie was actually made prior to (and which, incidentally, I also included on my ‘Best of’ list for that year), the movie cartwheels through different times – we see our protagonist as a boy, as a young man, and as a centenarian on the edge of death. Not only that, though: we see different iterations of those times. One where the young Nemo chooses to stay with his father after his parents’ divorce and one where he stays with his mother. Three or four different timelines where he falls in love with different women. And throughout it all – through the weird, winding, intentionally cryptic plotting – the film is held together by an incredibly strong cast (including Leto, Rhys Ifans, Sarah Polley, and Juno Temple, just to name a few) and its gorgeous images. It plays tricks with your perception, and that always intrigues me. 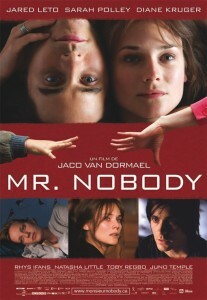 I want to celebrate Mr. Nobody just because of its confident weirdness. It’s all over the place, but then again, it’s all over the place. That’s thrilling. 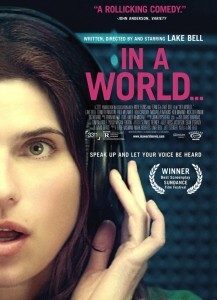 Maybe it’s because of her extensive television work, but writer/director Lake Bell’s In a World feels expertly written. When I think of this movie, my mind immediately jumps to a subplot about the rocky relationship of Bell’s character’s sister. The entire subplot is crammed into three or four short scenes, but it nevertheless packs an intense amount of pathos into that brief time, a full and satisfying narrative arc. But the A-plot is just as gripping: a hilarious comedy that has both a romantic streak and a strong feminist message, as Bell attempts to supplant her father as THE voice of movie trailers. Despite being told again and again that – as a woman – she’s not cut out for the role, she perseveres against the old boys’ club behind the scenes that we never knew about. Without giving too much away, the movie never feels like it has to make a trade-off between humor and drama, and so as the movie nears it conclusion, there are many ways that characters previously viewed as fairly one-dimensional or as vehicles for jokes begin to reveal the depth of their humanity. Although I’ve never been a huge fan, but Bell as star is matched by her puppy-dog love interest Demetri Martin. The two have a great chemistry that makes them feel less like star-cross’d lovers fated to be together than two people who really enjoy the company of one another and want to explore that feeling. In short, it’s a steady and honest portrayal of these big emotions, something I’ve always been excited about seeing on screen. In a World is a very funny, heartwarming, great movie. 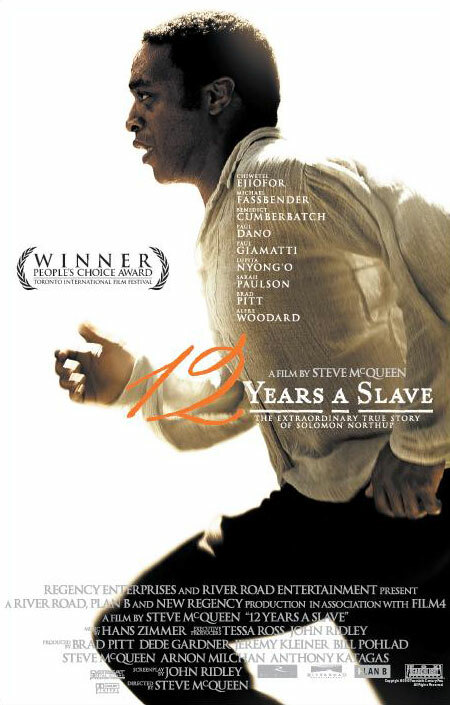 What makes 12 Years a Slave so rewarding is not the painful overarching narrative of the film, about a man kidnapped and sold into slavery in a time when the world was mad (or more mad than it is right now, at least). That is a huge part of what makes it powerful, of course, but what makes it so rewarding is in the minor moments. The one that I will always remember has a grown man holding a woman close and crying. The movie doesn’t comment on it, but we can see his tears rolling down her back. Whether it was intentional or not, it’s a striking image that the film was lucky to capture. There are a number of small moments like this, though. The crackle of an orange flame from a letter home being burned. The juice of a blackberry dripping on a plate’s edge. These moments are matched by tense, claustrophobic scenes. Everybody who has seen the film will remember an excruciating sequence where our hero Solomon Northup (Chiwetel Ejiofor) is punished for some supposed transgression, and the camera lingers on the aftermath while other slaves go about their business as though nothing has happened. Ejiofor and much of the rest of the cast bring a lot to the table, too; their lines are spoken with an eloquence and purpose reminiscent of the theater – forceful and passionate. Whether it was a mistake for the movie to focus on an educated black man who was free and therefore did not “deserve” to be a slave, or whether it was a mistake to lionize some of the white characters are likely arguments that will always attach to the movie. But the meat of the film, the pain and determination and hopelessness and rage that Northup felt all at once, it comes through strong, regardless. It hits the viewer hard. Admittedly, a lot of the humor of This is the End is fairly topical – it focuses on the exploits of today’s hottest young stars, all playing themselves (or versions of themselves). Whether the incongruity of Michael Cera as a coked-out horn-dog when compared to his soft-spoken demeanor in other projects will make sense to our children’s children, well… we’ll just have to wait and see. Yet the movie is not entirely populated with such time-specific bits. I described the mood in my review as “spinning out of control,” as the world comes to an end during a Hollywood party and society devolves into chaos. Several friends huddle together in James Franco’s barricaded home, dealing with a lack of fresh water, demons on the loose, and yes – an irritating open-floor plan which makes every whispered word all too audible to everyone else in the house. Much like James Franco and Seth Rogen’s Pineapple Express, the movie balances the absurd with the mundane to fantastic effect. It’s spectacularly funny, and it retains the affecting male bonding of the earlier movie(which used to be derisively referred to as “bro-mance”, but I think we’re past that as a people) without devolving into gay panic jokes. In fact, it’s really sweet. Take, for instance, a scene near the beginning of the movie where Rogen picks up his friend Jay Baruchel from the airport and brings him home to an assortment of snacks, drugs, and alcohol arranged to spell his name. It’s a cute gesture between friends, one that a movie made by other men might have been afraid to include. 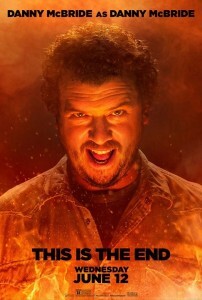 We’re lucky, then, that This is the End was made by this group: not only is it a laugh-a-minute absurdist comedy, but it also explores resonant themes concerning friendship and resentment. It’s stellar. 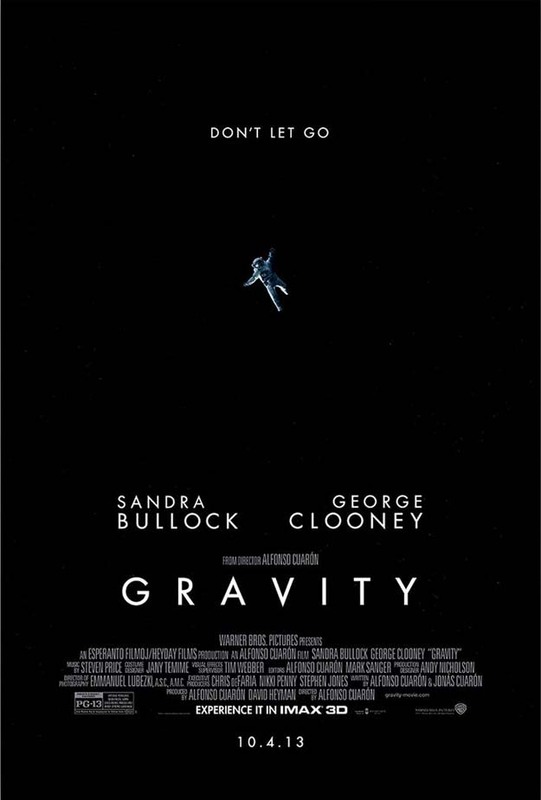 Unlike This is the End, there’s no question that Alfonso Cuaron’s Gravity will retain its power for years. Still, I wish I’d watched it more than once in the theater because a lot of what struck me about the movie may have been due to seeing it in 3-D. Not that that diminishes the movie’s power in any way: I have long been a vocal advocate of the use of 3-D. When the technology is used well, it immerses the viewer in a way that a flat screen simply cannot do. Werner Herzog’s Cave of Forgotten Dreams, for instance, may only be viewed in 3-D. Almost throughout the entirety of this film, we are focused on one person – Sandra Bullock. She is an astronaut, in space, in zero gravity. The movie captures the way it would feel to be weightless and insignificant out in the cold confines of the inky darkness with astounding perfection. The scene in the poster to the right is one of many breathtaking moments. Bullock loses her grip on the satellite she’s working on and begins spinning helplessly into the distance. The camera is immobile, the only color on the screen the shrinking figure at the center. Because of the heart-pounding action and the unusual location which has our heroine spinning around without much to ground her, it’s easy to get swept up in the events on-screen. I walked out of the theater feeling as though I had been weightless for two hours, my legs having to remind themselves how standing on solid ground is done. Whether that’s entirely attributable to the 3-D effect, or if it would have been achieved just the same if the movie was in 2-D is ultimately beside the point. Few films are able to involve viewers in such an immediate, visceral way. The feeling of being engulfed in the movie is something special indeed. I was told that Her was a masterpiece long before I’d had a chance to see it myself. Going in with such high expectations is a great way to be disappointed, but I nevertheless left feeling even more enamored with it than I had expected to. The short version of the plot is that Theodore Twombly (Joaquin Phoenix) falls in love with his computer (voiced by Scarlet Johansson), but that description does a grave disservice to a movie which is impeccably heartfelt, philosophical, beautiful, hilarious, and heartwarming. When I talk about my love for Say Anything, I often reference a scene where Lloyd Dobler and Diane Court have a telephone conversation. Rather than cut to a music montage of the pair talking on the phone so that we cannot hear their conversation, but understand that they’re “getting along” now, the movie listens in. Because Johannson’s character has no corporeal form, the entirety of Her is those sorts of conversations. We really understand the connection and love that the two characters have for one another, and all of this in spite of the fact that one of the leads is never on-screen. Also like Say Anything, the movie respects all of its characters. There is nobody who comes across as a “villain” – even people whose aims are at odds with the main couple are given back-stories, motivations, and their own emotions to make them fully-rounded human beings, rather than mere secondary players entering the background of our “hero’s” life. Despite being something of a science fiction scenario, Her feels instantly relatable. It’s a remarkable, winning work of art. 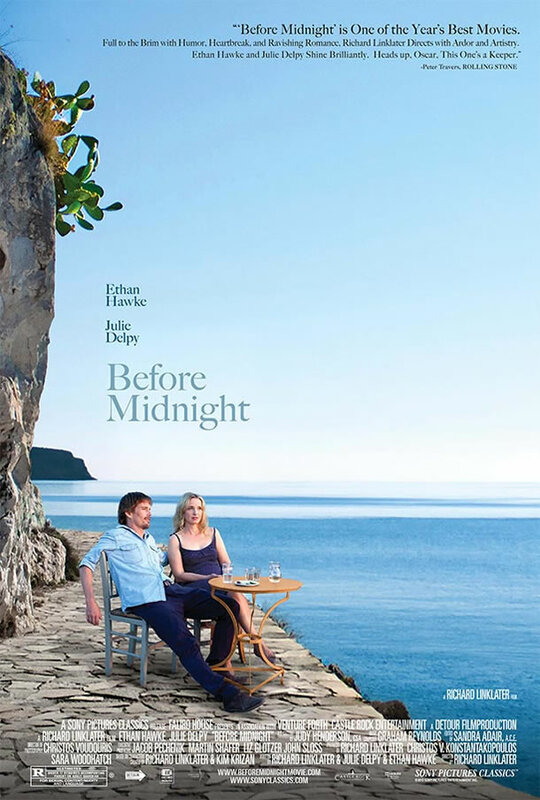 I feel great remorse at not having seen Richard Linklater’s masterful Before series sooner (Before Sunrise, Before Sunset, and now Before Midnight). Like the Up series, which I maintain is one of the highest uses of film as a medium, this series returns to our main characters every nine years. They first met on a train in Europe and spent a long evening together, getting to know one another, espousing their personal philosophical and political beliefs, and falling in love. In this third installment, the couple has been married for some time and their relationship is falling apart. 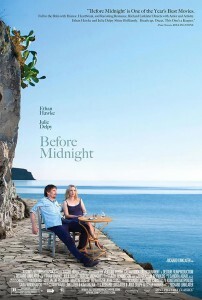 As its predecessors, the bulk of Before Midnight just allows Julie Delpy and Ethan Hawke (who also both helped write all three movies) to travel with one another and talk out their problems – recounting memories, arguing over transgressions, and philosophizing (of course) about the nature of “love.” Because of the wrenching nature of their discussions this go ’round, trying to salvage a failing marriage instead of carelessly frolicking in the heady intoxication of new love, this is the most affecting of the three. It’s tense, moody, and incredibly gripping. More than anything, it’s real (an attribute I consider hugely important). The argument comes to a head in a hotel room. Hawke sits on the bed, while Delpy lies on the couch in the living area. The camera is fixed in the front room, but with Hawke visible in the background. The conversation moves from a screaming match to a tentative resolution and back again, much as an actual conversation might. And as with all three films, the dialogue is so naturalistic that it all seems improvised. That loose, natural flavor makes the entire series – and this film especially – feel incredibly intimate. 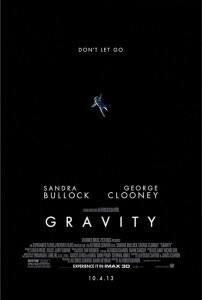 I felt as absorbed by this movie as I was by Gravity, yet even more invested because of the relationship I had with the characters from watching the previous entries in the series. A spectacular film in its own right, but equally impressive as the third leg of a triumph of cinema. I was not a fan of director Lucien Castaing-Taylor’s documentary Sweetgrass, which chronicled the driving of a herd of sheep over and through a mountain range. It was all long takes, near-silence, and little point. 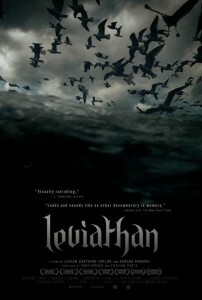 Leviathan is very similar in style, yet it is by far my favorite film of the year. Why? Leviathan takes place on a fishing boat at night and in the early morning hours, the dark sea and rusted boat a much creepier vision than sheep jostling through forest trails. Instead of near-silence, the movie is wall-to-wall with the sound of crashing waves, clanking chains, flopping fins, the gruesome slice of blades into fishy flesh, the cawing of gulls, and more. And perhaps most striking of all, the movie was filmed with hundreds of tiny cameras attached to the boat, the gulls, and elsewhere. This gives the camera a truly panoramic view – sometimes the image spins out of control, or remains upside-down for some time, or focuses in on something small, e.g. a fish head sliding back and forth on the flooded deck in time with the rocking of the ship. Not everything in the movie works, admittedly, but so much does. It’s a documentary, but it could very well be a surreal horror movie. I’ve seen the movie multiple times and each time, I’m holding my breath and clutching the arms of my chair… because Leviathan is an experience more than it is a movie. It’s a ride. You strap in and you hang on until it’s over. 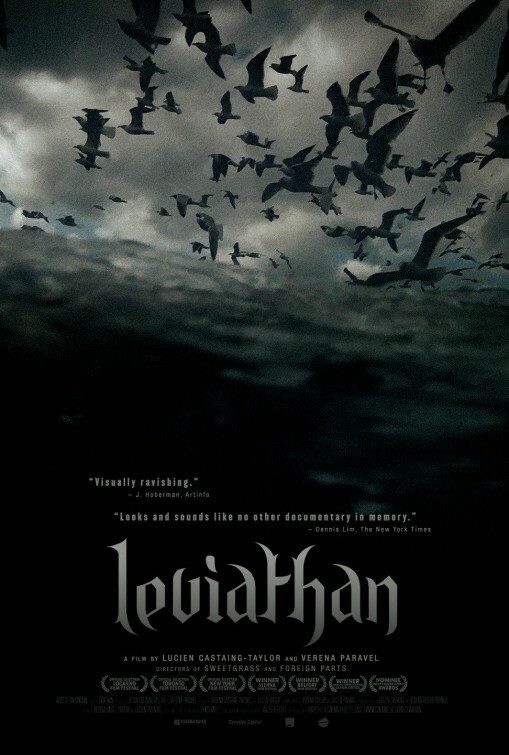 I saw no other movie quite as powerful, as inventive, as thrilling and incomparable as Leviathan in 2013. 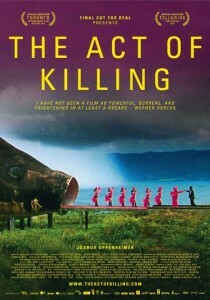 It expands the horizons of what a documentary can be, and it does it with a chilling effectiveness. It’s gross, gorgeous, hypnotic, and terrifying all at once. All of my top three were movies I’d enthusiastically recommend to anyone, but Leviathan is something that deserves to be celebrated. It’s truly one of a kind.